Have you heard? 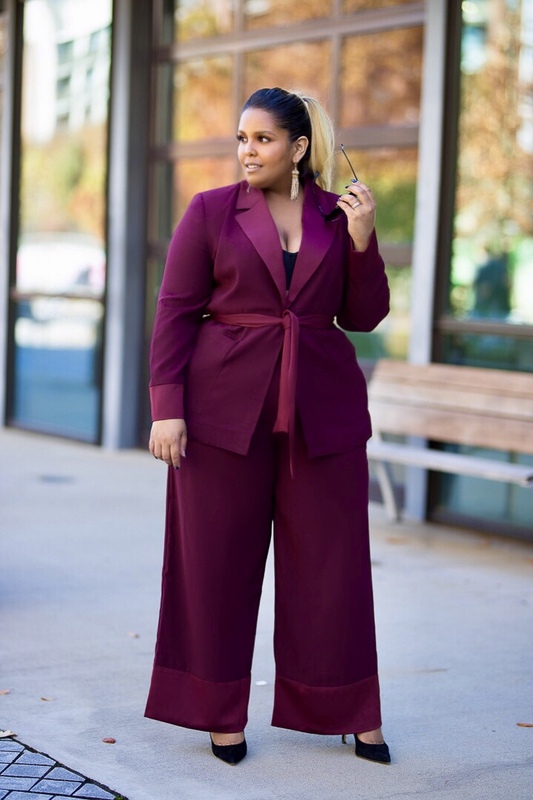 For all your holiday needs, we partnered with Paper Source to bring you an exclusive and customizable holiday card collection featuring ELOQUII prints you know and love! And if that’s not all, we’ve also launched beautiful customizable stationery, journals, and notepads for all your personal and organizational needs. We asked our friend Triena Deniese (@trienadeniese) to create her own for her lifestyle and share all about it! In addition to sharing the most beautiful holiday pictures ever, we caught up with her to learn how she holidays. Read on to check it out! This time of year is my all time favorite, so I love to incorporate traditions. One of my favorites is the night of Thanksgiving while my family’s all together we haul all of the Christmas decorations from storage and put everything up while the neighbors “sleep”. We are usually the first house in the neighborhood that’s lit with lights and we enjoy those bragging rights a little too much! I’m thankful for being consistent with working towards my dreams, because I’ve never seen so many goals fall into place like I did this year! I’m thankful for the woman I’ve evolved into today, I’m more confident and secure in myself than ever before. Lastly, I’m thankful for ELOQUII, because a curvy girl like me has to have a fashion-forward closet! This holiday season I’m looking forward to blending my husband and I’s families. This is our first year married and my husband’s family will be celebrating with my family. I foresee to lots of dancing, soul food, and card games! What is your favorite part of your ELOQUII x Paper Source paper products? The best part of my ELOQUII x Paper Source paper products is the quality and personalization. Like ELOQUII, Paper Source products make you feel one-of-a-kind. It also helps that you can personalize each stationery item to your liking; and I find that all of the stationery seamlessly aligns with lots of ELOQUII collections (old and new). It’s a win-win! What will you be using the paper products for? I’ve already used my Paper Source paper products for so many things from making holiday shopping lists to jotting down cute recipes for holiday potlucks I’m attending. I also left my husband a sweet note to meet me at his favorite restaurant last week, it was the cutest! Any big New Year’s Resolutions? So confession, I don’t make New Year’s resolutions, instead I make “intentions.” For 2019 my biggest intention is to be more present. As a natural born planner, I tend to focus only on what’s a head of me instead of what’s happening in the moment. There’s so much joy that can be found in being present, and I plan to find that joy this coming year. There are a few other things I’d like to add to my list like travel more, purchase a new property … but we will start with being present for now haha. I’ve never been a big movie watcher, but I cannot go a Christmas without watching Home Alone. Last year I was able to convince my 8 year-old nephew to watch it with me and he was hooked! Hot Chocolate for sure. Don’t forget the marshmallows! You can’t do the holidays without gingerbread! What’s one thing you’re proud of in 2018 and one thing you’re looking forward to in 2019? I am most proud of my blog trienadeniese.com and the impact it’s had on women with curves. Every day I receive a message that I’ve inspired someone, and that’s what matters most. In 2019, I look forward to sharing more light through my blog. Excited to start your New Year’s Resolutions? Check out all our custom stationery, notepads, and journals from the ELOQUII x Paper Source collab and start planning your NYE looks now!